, a celebrated philosopher and mathematician, was born at Edmonton in Middlesex, Aug. 28, 1685. His grandfather, Nathaniel Taylor, was one of the Puritans whom Cromwell elected by later, June 14, 1653, to represent the county of Bedford in parliament. His father, John Taylor, esq. of Bifrons in Kent, is said to have still retained some of the austerity of the puritanic character, but was sensible of the power of music; in consequence of which, his son Brook studied that science early, and became a proficient in it, as he did also in drawing. He studied the classics and mathematics with a private tutor at home, and made so successful a progress, that at fifteen he was thought to be qualified for the university. 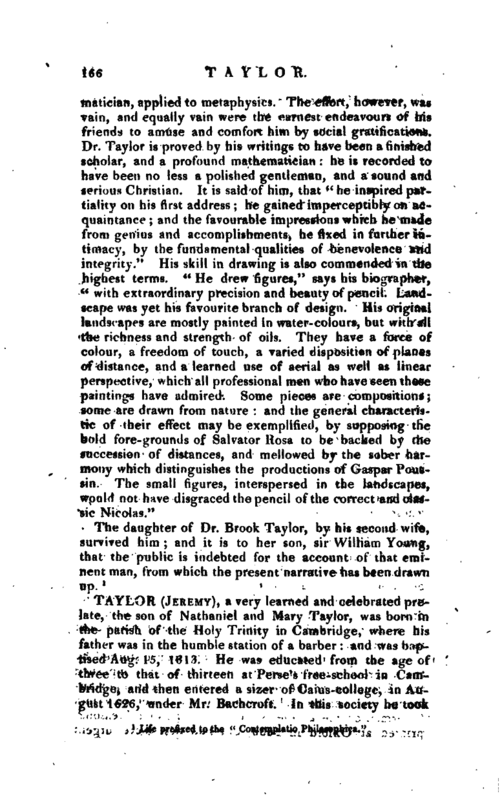 In 1701 he went to St. John’s college, Cambridge, in the rank of a fellow-commoner, and immediately applied himself with zeal to the study of mathematical science, which alone could gain distinction there. It was not long before he became an author in that science, for, in 1708, he wro e his “Treatise on the Centre of Oscillation,” though it was not published till it appeared some years after in the Philosophical Transactions. 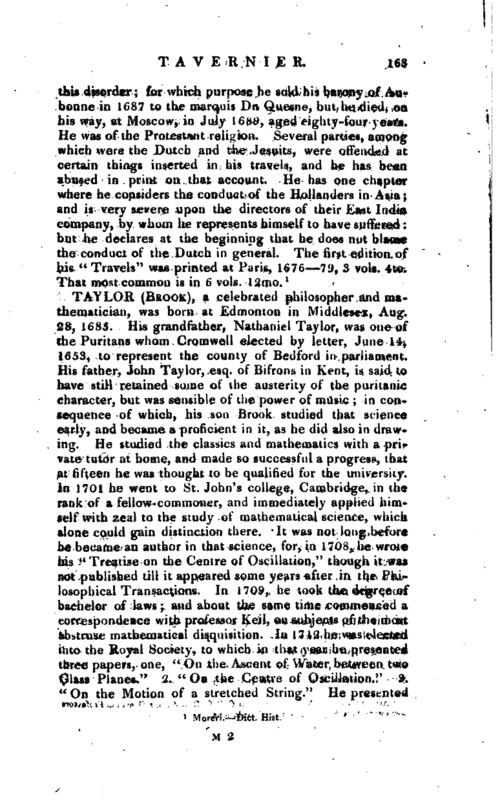 In 1709, he took the degree of bachelor of laws; and about the same time commenced a correspondence with professor Keil, on subjects of the most abstruse mathematical disquisition. In 1712 he was elected into the Royal Society, to which in that year he presented three papers, one, “On the Ascent of Water betwetMi two Glass Planes.” 2. “On the Centre of Oscillation.” 3. 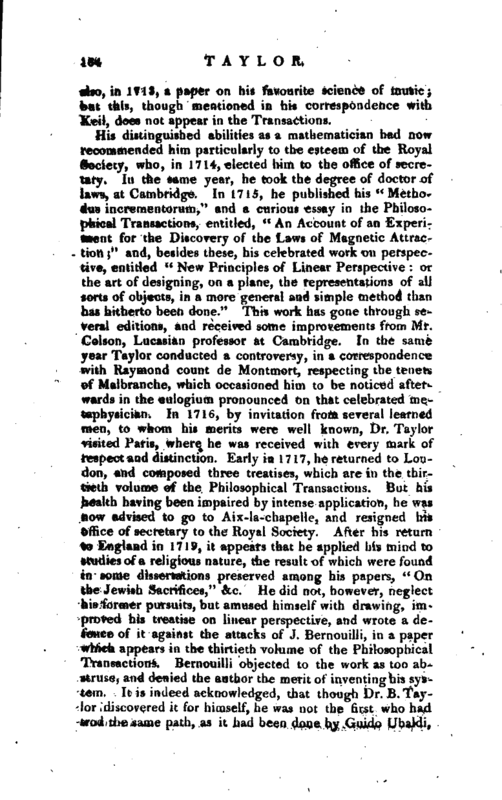 “On the Motion of a stretched String.” He presented | also, in 1713, a paper on his favourite science of music; but this, though mentioned in his correspondence with iteil, does not appear in the Transactions. 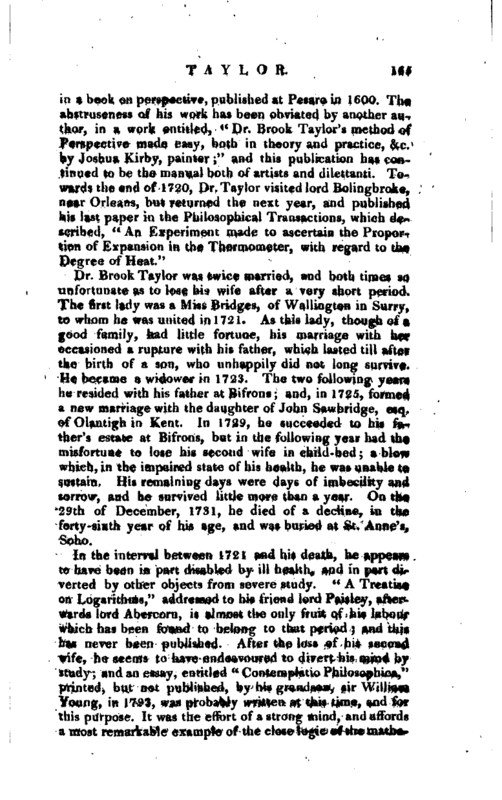 Dr. Brook Taylor was twice married, and both times so unfortunate as to lose his wife after a very short period. The first lady was a Miss Bridges, of Wallington in Surry, to whom he was united in 1721. As this lady, though of a good family, had little fortune, his marriage with her occasioned a rupture with his father, which lasted till after the birth of a son, who unhappily did not* long survive. He became a widower in 1723. The two following years he resided with his father at Bifrons; and, in 1725, formed a new marriage with the daughter of John Sawbridge, esq. ofOlantighin Kent. In 1729, he succeeded to his father’s estate at Bifrons, but in the following year had the misfortune to lose his second wife in child-bed; a blow which, in the impaired state of his health, he was unable to sustain. His remaining days were days of imbecility and sorrow, and he survived little more than a year. On the 29th of December, 1731, he died of a decline, in the forty-sixth year of his age, and was buried at St. Anne’s, Soho.